UK Stampin' Up! 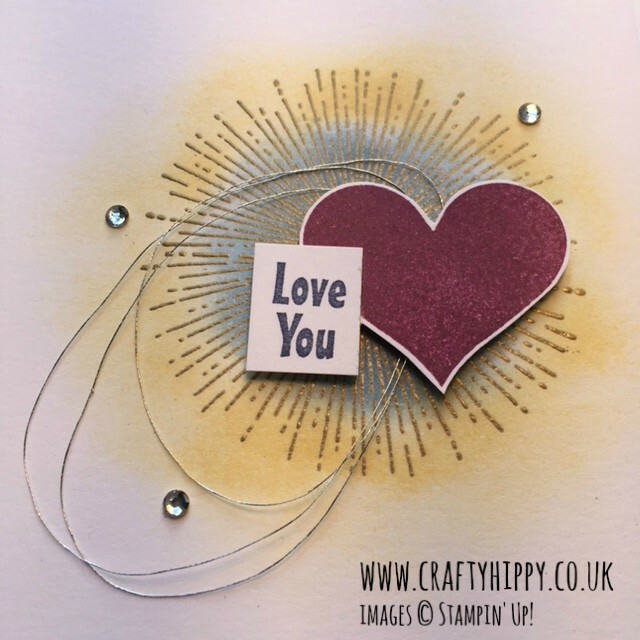 Demonstrator | make beautiful cards | Crafty Hippy: Create gorgeous detail using the Heart Happiness and Amazing You stamp sets from Stampin' Up! Create gorgeous detail using the Heart Happiness and Amazing You stamp sets from Stampin' Up! As we head into February (home of Valentine's Day) I start to think about hearts. Apart from being a hopeless romantic I think they're really pretty, which is saying a lot for someone who's not especially girly. I really enjoyed creating this design - I used three stamp sets in all but it was so worth it. I used Amazing You for the beautiful sunburst design, and Party Pandas for the sentiment - please note that these stamp sets are FREE during Sale-A-Bration. I used Heart Happiness for the gorgeous heart which I stamped in Rich Razzleberry. One of my favourite colours. Of course you could vastly change the look of this card by using different colours.